Blogging is more common than ever these days, which makes it hard to stand out in a crowd. 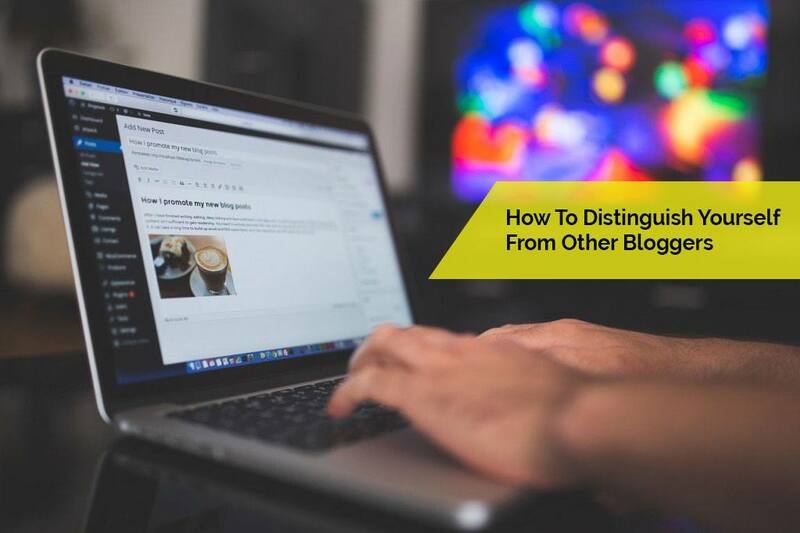 What you need are ways for you to distinguish yourself from other bloggers and catch the attention of readers. If you aren't careful, you'll soon get swept up into the general category of being a blogger, and your site may not see much traffic. You have to be willing to work hard and put yourself out there if you want to see impressive results. Don't be afraid to take a different approach or speak what's on your mind even if it goes against what the crowd is saying. The key here is that you're passionate about what you're writing on and that the basis for your blog is a topic you can get behind. Don't pick a random subject matter and expect to reach new heights as a blogger because you'll likely quickly lose interest in what you're doing. It'll soon become clear to your audience you're not into what you're discussing. Pick a niche based on a hobby, interest or expertise that you find compelling and you know you'll be able to come up with a lot of blog posts around. Search for other blogs in your niche and pinpoint what they're not doing that you can start implementing on your blog, so you stand out. Not only should you have an attractive blog, but make sure it's unique and personal to you. Work with a designer if you want it to truly look professional and get the right kind of attention. Also, create your own logo to represent your blog and help you to make a name for yourself. This will be an easy way for readers to quickly recognize your content and posts on social media. Consider colors, fonts, and layouts you find appealing, and that is easy to read on a computer or mobile phone. Remember this is your personal brand you're talking about, so you want it to look polished and like you put some thought behind it. Make sure when people land on your blog they can tell what you're all about in a matter of seconds. Along with publishing content consistently, you must make sure it's of high quality. Tell stories and don't simply type words on a page with no direction. Setting yourself up for success doesn't start with the blog itself. Having a comfortable, quiet place like a home office where you can be creative and write compelling blog posts is essential. One gadget that will help you write better is getting yourself an under desk keyboard tray that's adjustable and comfortable. You need to be at ease if you want your creativity to flow and having a quiet and comfy spot to crank out your blog posts is the perfect solution. In addition to the keyboard tray, purchase a sturdy desk and chair that won't hurt your back after sitting for long stretches. Not a lot of bloggers have the time or energy to invest in coming up with a marketing and social media strategy. Set yourself apart by putting some thought to how you're going to attract more readers and build an online presence. Sit down and map it all out ahead of time so you don't have to do a lot of thinking once you're knee deep in your busy week trying to accomplish many tasks at once. There are also tools out there you can use to automate the process so you can focus on creating more quality content and completing other necessary tasks. Also, build your email list and start email marketing campaigns to keep readers engaged and interested in your blog. Even as (or perhaps more!) important than your quality content are your titles and visuals you use for each blog. It's a good idea to work ahead and come up with a long list of possible headlines that will grab a reader's attention immediately and that you can use for your various blog posts. This is one of the main ways you're going to be able to attract users when you're competing with a lot of other websites. Also, don't forget many people are visual learners and want to see images with your content. Always make sure you have a header photo and then include several different visuals within each blog post to make it more interesting of a read. One way to build blogger relationships and get your name out in public is to reach out and offer to guest post on other people's websites. Putting your material on various popular blogs is a great way to distinguish yourself and get your site and name on other people's radars. Include a link back to your website if possible to help you rank better in the search engines. To get the most out of this venture you want to submit quality posts on sites that are considered high authority within your niche. One area where you have a lot of potential to separate yourself is through making sure you're consistent with maintaining your blog and posting content. Many people start blogs without understanding how much time and effort goes into managing them and making sure there's always fresh blog posts being published. Create and follow a content calendar to help you get organized, always keep up to speed with the latest updates for your website and correct any errors or spelling mistakes. It's not a good idea to post a few blog posts here and there, disappear for a while and return again when you want. Your readers want consistency out of you, and it's the only way you're going to keep their attention. It's not easy to be different and unique in the world of blogging. There's a lot of competition and talented bloggers out there, so be patient with yourself if you don't see results immediately. It takes time and a lot of effort to stand out online and build a strong reputation for your blog, but don't give up because soon your hard work will pay off.